Isn’t it surprising how easy and quickly a baby to get into trouble around your home? Making your house child-safe means that whatever your baby might try to open, pull on, or play with is secured or anchored and won’t hurt them. Here are some simple and affordable ways to child-proof your home. Collisions with furniture are a major concern for your baby, using cushioned corner guards or edging to coffee and side tables, and any other sharp-cornered surfaces will help soften the blow. Investing in brackets to anchor large, heavy pieces of furniture to the wall. Installation of brackets to anchor and attach the TV securely to an entertainment center or the wall so that your child can’t pull it down on his/herself. Keep any climbable furniture away from windows so that curious little ones aren’t tempted to climb. Locks on windows are also mandatory to comply the with the Schemes Management Regulation 2016 introduced the requirement on Owners Corporation to install complying window safety devices for all windows of eacPowerpointin the strata scheme. The easiest way to stop little fingers or other objects from being pushed into unused power points is to put powerpoint protectors into them. Dangling cords from blinds are one of the top dangers for babies and toddlers. How can I make my blind cords safe? Something you can do right now is to cut looped blind cords so they no longer act as a noose. 1. Before you start, check that your blinds will still work with cut cords and that it won’t void your warranty. 2. Cut looped cords on the blind, curtain or venetians, just above the tassel. 3. 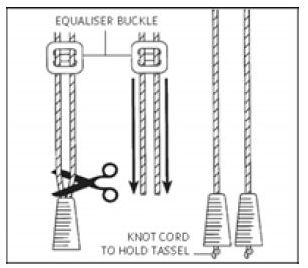 Remove any tassel and equaliser buckle. 4. Attach a new tassel to each of the pull-cord ends. 5. Knot the cord to hold the tassel (see illustration). Another option is to tuck the cords up high so they can’t be reached by children even if they are standing on a bed or other furniture, or if they are climbing. There are also a number of safety devices on the market specifically designed to keep cords out of harm’s way. Cleats are small fixtures that attach to the wall, and blind cord wind-ups are another option. Ideally, to completely remove the risk of cord-related accidents and injuries, replace all of the corded blinds in your home with cordless blinds. A national mandatory standard regulating the supply of ‘corded internal window coverings’ applies to retailers and other suppliers. From 1 January 2015, a second national mandatory standard imposes requirements on people or companies who install corded internal window coverings, in trade or commerce, to bring installations in line with existing requirements for suppliers of these products. It’s very easy to get distracted while you’re in this room, cooking, cleaning, etc, so you want to be sure your child can’t get into trouble if you turn your back for a second. Installation of latches on cabinets, cupboards and drawers that contain sharp or harmful items is a great idea. The use of stove-knob covers and safety gates also will provide further piece of mind. If you have cleaning supplies and detergents in low cupboards, it’s recommended to move them up high instead out of children’s reach. Keep the bottom cupboards (even if you use safety latches) for things that are safe for baby, like pots, pans and plastic containers. The same goes for drawers, place any suffocation and choking hazards and anything sharp in high drawers, and put things that are safe in the lower ones. As you did in the kitchen, move harmful products from high shelves, and remove all electrical appliances to avoid electrical dangers. Invest in a thermometer to ensure baby’s bathwater is a safe temperature and consider installing latches on cupboards and toilet. Plants are a beautiful addition to any home, but, some are poisonous and can be very heavy. Some need gravel or mulch that could make a child sick if eaten, and many of the best decorations, like marbles and rocks are choking hazards. Try switching these with medium sized stylish artificial plants such as Monsterias, Fiddle Leaf Figs or smaller artificial plants for the bench or dining tables. Installing child safety gates are an ideal solution for the top or the bottom of the stairs. Installation against sliding doors, open doorways and secured to walls are ideal for the safety and piece of mind that you need in your home. Need to update your home to be child Friendly? At Hire A Hubby we are here to help and to take all of the stress out of the items around your home on your “To Do List. Call your Local Handyman on 1800 803 339 or book a free quote at www.hireahubby.com.au.